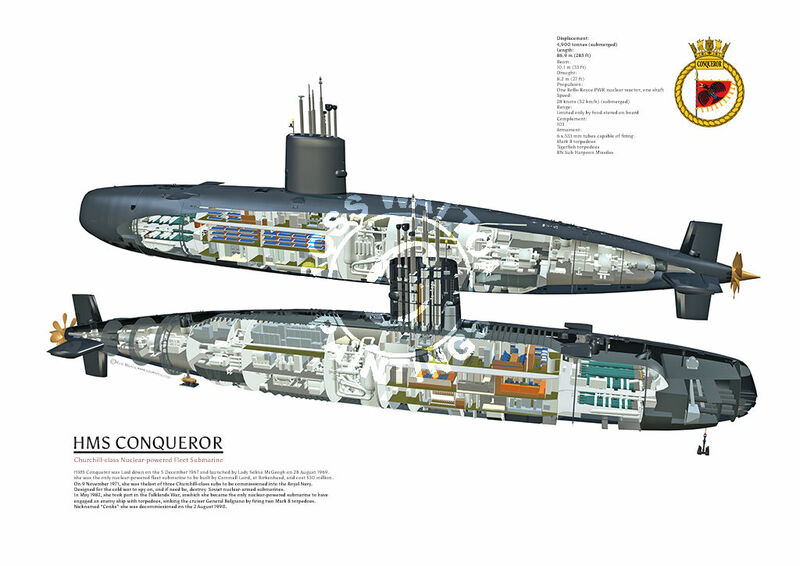 HMS Conqueror was laid down on the 5 December 1967 and launched by Lady Selina McGeogh on 28 August 1969. She was the only nuclear-powered fleet submarine to be built by Cammell Laird, at Birkenhead, and cost £30 million - designed for the cold war - to spy on, and if need be, destroy Soviet nuclear-armed submarines. On 9 November 1971, Conqueror was the last of three Churchill-class subs to be commissioned into the Royal Navy. engaged an enemy ship with torpedoes, sinking the Argentinian cruiser General Belgrano, by firing two Mark 8 torpedoes. Nicknamed “Conks”, she was decommissioned on the 2 August 1990.